Some of the most at-risk areas for wildfire are in the Wildland Urban Interface, or WUI, which is defined as residential areas that abut to open space. As more people, homes, and businesses move closer to open space, the risk of wildfire damage is increasing. Although we can’t stop fires from happening altogether, we can reduce the damage they cause by learning how fires behave and how we can be better prepared. 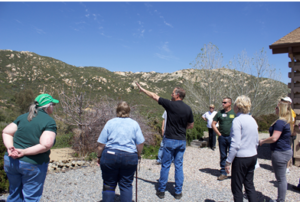 Our “Fire Operations in the Wildland Urban Interface” workshops teach the principles used by firefighters in suppressing wildland fires and protecting structures in the WUI. Captain from San Diego City Fire Department. Participants learn about fire behavior prediction and how to apply this knowledge to their community’s topography, fuels, weather, and home construction. Training includes a field trip to selected homes to do a site assessment on lessons learned. Participants will also learn about evacuation and valuable survival tips they can utilize in the event of a fire. Check the calendar for a workshop in your community.